My visit to New Bedford Meeting was deeply blessed. 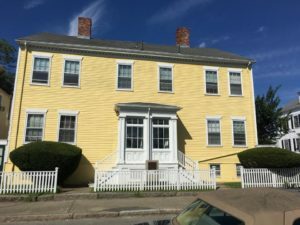 This meeting has had a huge history among New England Friends – seat of the whaling industry, Quaker abolitionist movement, so many faithful motions in this place. The Meetinghouse itself can hold hundreds of Friends. At one time in our history, it did. Today we were less in number, but deep in Spirit. I arrived early, and since the door was not yet open, I walked around the block. 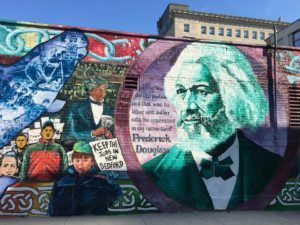 I took in the house where Frederick Douglass had lived, looked at the first meetinghouse, that had been moved, and later was home to the Quaker “New Lights” movement. I saw the initial clearing for construction of “Abolitionist Row Park” on the corner. This whole area is steeped in history and goodness and struggle and witness in the Light. As the Friend with the key had not yet arrived, I found myself sitting on the stoop in front of the meetinghouse. Three folks walked up, looking around, trying to figure out access. 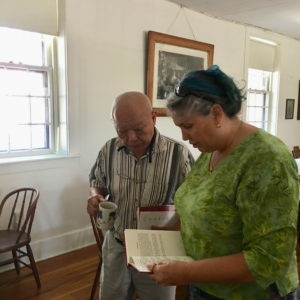 They were newcomers – seekers local to the area, who had heard of the Quakers, and decided today was the day they would visit for the first time. 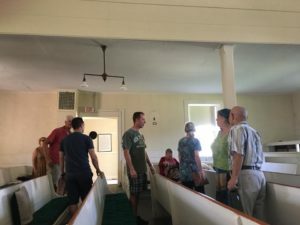 Perhaps otherwise I’d have been concerned that the meetinghouse was not yet open – but they had questions, and I was grateful for the time to chat about Quakers, both our history and where we are today. I told them I was a traveler among Friends, and I had felt called to visit on this day, in this place – traveling as some of us do. They had just watched “Friendly Persuasion“. They had read about Friends. They had great questions, and had done their homework! A good lesson for any of us – visitors often arrive eager to learn more. I was grateful to know I had a brief history of Friends, and common general knowledge about Friends in New England, at my fingertips. 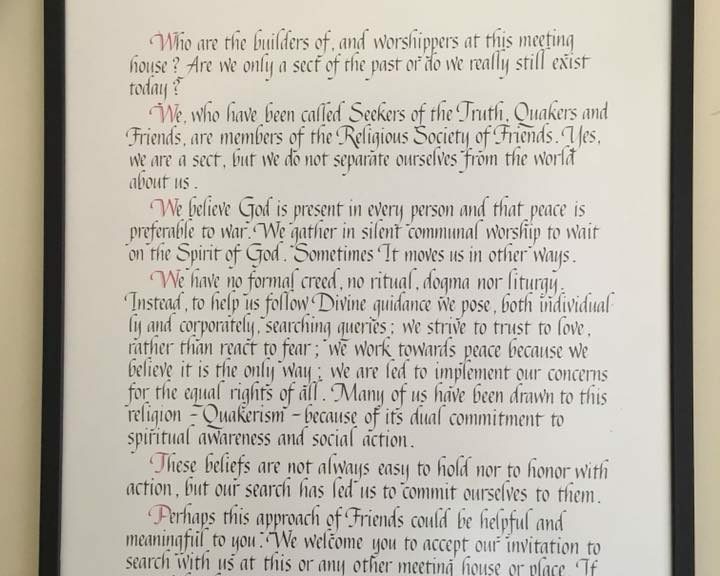 I also had a business card, and the URL for Quakers in New England. Margaret Fell would have had the same in this circumstance I am sure! We moved to the back of the building, and a few more Friends slowly trickled in (still no key). Yet ANOTHER visitor showed up, not related to me or the other group. This tiny meeting was suddenly a very popular spot on this sleepy summer morning! A birthright Friend from the meeting had arrived by then – and she took over with her deep knowledge of the history of this meeting, and Friends in the area. She spoke not as though this was an ancient time and witness – but just an extension of the People she knew, and loved, and told us how she followed their example today. The key arrived and in we went! Worship took place in the front rows of the expansive meeting room. Our group of twelve might have seemed dwarfed by the large room – but I sensed we filled the space as required of us. There was a long, inspiring, prophetic message for us. There was a quieter, comforting message of hope in troubled times and a broken world. Through it all there was a deep silence that surrounded us, newcomers and old timers alike. The meeting broke with hearty handshakes shared by all. Fellowship was sweet and informative. Newcomers were given copies of faith and practice, and answers to their questions with tea and cookies. There was news about the Quaker way, local community farming and events, and wider Quaker work shared among us all. I was especially eager to hear news of the Meeting’s relationship to the Ramallah Friends School. That has risen as a keen interest for me. I was invited to return to learn more. 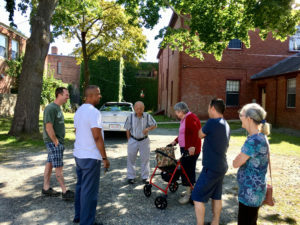 I was also told about the city initiatives to extend the historic district into the meetinghouse’s footprint and area. While the conversations were about the past – they seemed rooted in the present, as I heard about the work of the individuals in this meeting in the greater community and the wider world (Quaker and beyond). I have heard this tiny meeting, sometimes in the recent past with just 2-3 worshippers present on First Day, as “dying” or floundering. Perhaps that is true, perhaps it is not mine to say. But this particular day, this particular group of Friends was deeply faithful to the moment, to where they were asked to be. I’m not sure if the massive meetinghouse is a blessing or curse for this group. I think it might in fact be neither. I have not had a sense it is our Quaker call to “fill the space to the rafters” as it had done in previous years. On this day, it was a home for the prophetic voice among us, the Holy Presence that calls when two or more (maybe many more) are gathered. I left remembering the eager conversations about Work in the world. Perhaps a different “mission field” is rising for Quakers of New Bedford and beyond in this time. And perhaps it is not limited to those on the Quaker Path – but those seeking a relationship with the Divine, with our neighbors, with the earth that sustains us in the kingdom on both sides of the hedge. A game of chance or Spirit led ministry? How do we get “picked” and why does it matter so much?